The Delhi Medical Association (DMA) would soon initiate a campaign against illegal labs and diagnostic centres through its 13 branches in the national Capital. According to the city medical body, over the recent years several illegal units have mushroomed in the city as the government has not been able to take up the Delhi Diagnostic Centre and Laboratories Registration Bill introduced in 2005 effectively. Sirajuddin and Anwari Begum, parents of seven-year-old Mohammed Ahmed who happens to be the first patient to be awarded free treatment for Gaucher at AIIMS following a verdict from the High Court in April this year, are worried about the fate of their last surviving child. The Aam Aadmi Party today alleged that the Bharatiya Janata Party (BJP) is trying to hush up cases of corruption and serious crimes against its MLAs and their relatives in Delhi by pressurising the Delhi Police through the Union Home Ministry. The Aam Aadmi Party (AAP) today said the Union Public Service Commission (UPSC) has failed to handle the ongoing crisis related to the civil services examination and it should postpone the prelim exams, slated for August 24. Student activists of the Congress's National Students Union of India (NSUI) demonstrated against the issuance of admit cards by the Union Public Service Commission (UPSC) at Jantar Mantar, demanding the scrapping of Civil Services Aptitude Test (CSAT). 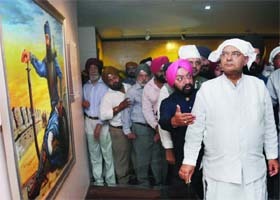 Union Finance Minister Arun Jaitley inaugurated the Baba Baghel Singh Sikh Heritage Multimedia Museum at Gurudwara Bangla Sahib in New Delhi today. To showcase the broad perspective of Sikh heritage and teachings of the Sikh Gurus, Vikramjit Singh Sahney, the chairman of the Sun Foundation, has established the Baba Baghel Singh Sikh Heritage Multimedia Museum in memory of his late father, Gurucharan Singh Sahney. A 45-year-old man and his son were killed when a truck overturned at a traffic light in Vivek Vihar, east Delhi, and rammed into their bicycle early this morning. The two men who lost their lives have been identified as Surinder and his son, Ajay (25). An argument over parking at Janpath led to a fight between the residents of a bungalow and the occupants of a car parked near its gate last night. The car was parked outside the bungalow at Janpath. The Bill was aimed at providing registration, conducting inspection and ensuring proper regulation of diagnostic centres and laboratories in the national Capital. As per this proposed law, all the labs and diagnostic centres have to be registered with the Delhi government and guidelines were made to run a diagnostic centre and labs in the Capital. This was because a number of labs were exploiting poor patients, but nothing has happened since then, pointed out DMA finance secretary Dr Ashwani Goyal. Adding that the DMA pursued this issue with the authorities concerned, but the government did not heed to its concerns, he noted that the DMA will pursue the matter afresh and make efforts for the implementation of this Bill. The initiative will be to create awareness among members about the Code of Ethics and Regulations, 2002, of the Medical Council of India related to the professional conduct, etiquette and ethics for the registered medical practitioners, said Delhi unit secretary Dr S.K. Poddar. On the issue of sting operation on unethical practices, DMA president Dr Anil Goyal said, "In the centenary year, DMA members pledge and reaffirm their commitment to provide ethical and quality healthcare to the patients and also condemn the malpractices in any form in medical profession." As after providing treatment to the child in June, the All India Institute of Medical Sciences (AIIMS) "stopped" it stating that it had not received any funds from the Delhi government. The child was supposed to get the next round of treatment scheduled on July 8 and 22, but the parents are left in gloom after being sent back by the AIIMS. Standing with distended abdomen, swollen lymph nodes, thin limbs and black-brown skin pigmentation, Mohammed was one among scores of Gaucher disease patients who accompanied by their families silently marched to the Prime Minister's residence today to seek financial support from the government. The walk, organised by Lysosomal Storage Disorder Support Society (LSDSS) on the occasion of the first International Gaucher Day, saw participation from patients along with their parents holding placards and banners. They called for a national policy to provide lifelong free treatment to people suffering from such rare diseases. "Again destiny brought him to the same place he started. With each passing day, Ahmed's condition was deteriorating fast. He needed ERT (Enzyme Replacement Therapy), the only available treatment costing around Rs 5-6 lakh every month for the rest of his life. I cannot think of losing my fifth child," said Sirajuddin, a rickshaw puller. Diagnosed with Gaucher as an infant, Ahmed suffered from fever, his abdomen started swelling and his weight came down to mere 13 kg at the age of six, Mohammad's four siblings (three boys and one girl) have already lost their battle to the rare genetic disease. The party appealed to the Delhi Police to reject all attempts to influence it and carry out a fair and impartial probe in all cases. The claims from AAP are regarding cases involving Rajinder Nagar BJP MLA RP Singh, who allegedly beat up a junior engineer of the Delhi Jal Board in his office and the murder of Akha Salouni, the 29 year-old youth from Manipur. "There is sufficient evidence to show that the police are being pressurised into diluting these cases. It is shocking that the MLA chose to beat up the engineer who refused to heed to an illegal demand of awarding a contract to one of the BJP workers," the AAP said, while accusing the police of dragging its feet on taking action. According to the party, a clear case of corruption and physical assault is made out against the MLA and the DJB too had made a complaint to the Rajinder Nagar police station. "The police authorities had been reluctant to lodge an FIR which indicated that the police were under pressure from the Central government not to act against BJP leaders," said the party. In the other case, the accused in the Manipuri youth's alleged murder is reportedly a close relative of BJP MLA from Badarpur, Rambir Singh Bidhuri. "What is disturbing is that Delhi BJP leaders are giving statements to show this gruesome incident as a case of road rage, which is completely uncalled-for, since the case is at investigation stage. Can the BJP answer why is it trying to pre-empt the police probe by giving statements to twist the cause of murder," AAP questioned. The party also demanded a judicial probe into the police crackdown in the national Capital on civil services aspirants who were protesting against the UPSC's Civil Service Aptitude Test (CSAT) pattern. Releasing photographs of students injured in Mukherjee Nagar on Thursday night, the AAP also demanded that the Union home ministry should make a public statement over the issue. "It is a matter of shame that the new Central government is following in the footsteps of UPA government in dealing with peaceful protests by attempting to crush the voices being raised in a peaceful manner," the party said. The UPSC must immediately take back the online admit cards for the preliminary civil services examination, which became the latest flashpoint on Thursday, said the party. The UPSC should invite the protesting students for talks and listen to their grievances and try to sort them out on the spot and make a public announcement that no discrimination on the basis of language will be allowed in the civil services examination. The expert panel set up to examine the CSAT must be asked to submit its report within 48 hours, the AAP stressed. Protestors lashed the BJP-led Centre, accusing it of giving populist assurances. Protesters gathered with banner and posters at Jantar Mantar and raised slogans. Delhi Congress president Arvinder Singh Lovely also joined the protesting group. "The Centre has done a U-turn on the critical issue of students protesting against the format of UPSC exams.," said the protestors. Noting that the BJP made false promises on the pretext of gaining populism, the NSUI activists said, "Looking into the widespread agitation, the Central government promised in the House that the students' demands would be looked into, but the issuance of admit cards reflects the dual face of BJP leadership." In this endeavour, he has been supported by the Delhi Sikh Gurudwara Management Committee (DSGMC). The museum is named after Baba Baghel Singh, a Sikh warrior who conquered Delhi in 1783, according to a press release on the event. While addressing the gathering of devotees, Sahney said, "The lives and times of Sikh Gurus have left an indelible imprint on mankind. The museum portrays the teachings of Sikhism." Speaking on the occasion, Jaitley said Sikh religion is full of sacrifices for the country and it preaches universal brotherhood and secularism. Manjit Singh, the DSGMC president, said that the museum will showcase the values of Sikh religion which preaches peaceful coexistence. According to the police, Surinder works as a safai karamchari (cleaning staff) of a municipal corporation at Jhilmil in east Delhi. His son also had a temporary job there. The police have arrested the truck driver, Narender (35). A case under Sections 279 (rash driving or riding on a public way) and 304 A (causing death by negligence), the Indian Penal Code, in regard to the accident has been registered at the Vivek Vihar police station. A police officer privy to the details of the accident said that Narender had collected the construction material from a "mixing plant" of the Delhi Metro Rail Corporation (DMRC) and was driving the truck to Mayur Vihar, where the DMRC was carrying out its work. "Vivekanand Mahila College traffic light falls in the way. Narender was driving the truck at a high speed. He lost control over the truck at the traffic light and it overturned. The truck rammed into Surinder and Ajay who were going on the bicycle. They died on the spot," said the officer. Both of them were headed to the East Delhi Municipal Corporation office. The beat constables, who were patrolling the area when the accident took place, caught Narender. The postmortems were conducted at Guru Teg Bahadur Hospital in Dilshad Garden locality. The police have handed over the bodies to their families. The six occupants of the car had gone to a night club nearby. The residents of the bungalow were allegedly angry that the car was parked there, said a police officer.